Be the charismatic man at the center of attention with this intense Mont Blanc Emblem fragrance to spice up your ensemble. Steeped in the quintessence of Mont Blanc designer house, the singular 2014 scent features warm and contrasting notes that perk up the senses. With a woody and tonka base for stability, a tasteful heart of cinnamon and violet leaves, and top notes of cardamom, grapefruit and clary sage for strength, this fragrance draws attention wherever you go. 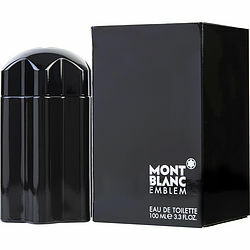 I love Emblem by Mont Blanc. It is one of my favorite scents. I get compliments whenever I wear it. Definitely worth the purchase. OMG...my bf and I were walking thru the mall when we came across this scent. He tried a little and, lets just say, it did something to me. Wow. I insisted that he go home with it and he hasn't regretted it ;) luv. this. scent.